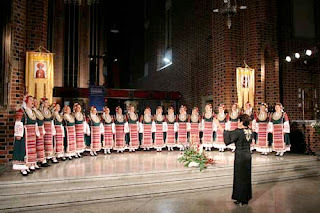 'The present CD offers to the admirers of The Mystery or Bulgarian Voices famous folk choir the unique opportunity of once again relishing part of the unmatched Bulgarian folk treasure-trove - old Bulgarian Christmas songs performed on Christmas eve and songs for health, happiness and fertility, done on St. Lazar's Day, Saturday before Palm Sunday. The Christmas-time songs are sung by young men at peasants' home for health and good crops. They differ considerably in sound compared for instance with the traditional European Christmas carols and are characterised by optimism and fiery dance rhythms, a variety of metre in the asymmetric measures - from 5/16 to 17/16 in a multitude of combinations. ... and George Harrison recently called this album his favorite recording.